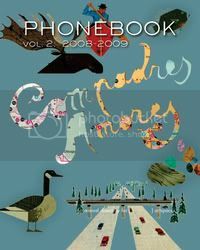 Up for grabs this week is PHONEBOOK vol.2 published by threewalls and Green Lantern Press. Third person to email me (megonli@badatsports.com) gets the copy. Thanks Caroline for hooking us up! “Back by popular demand, PHONEBOOK is the essential travel guide to artist-run centers, small not-for-profit, fringe galleries and other exhibition and presentation projects. This new edition adds over 50 news spaces in the United States and over 40 Canadian centers alongside updated entries, periodical listings, a series of essays from across the country and some road-trip tips from the editors.